There are plenty of cats that look like Hitler, but this is the first one I’ve seen who looks like Lenin. This image totally freaked out one well-known atheist blogger. Now if only we could find one that looked like Pol Pot, we’d have an atheist trifecta . . . This entry was written by whyevolutionistrue and posted on April 6, 2011 at 10:30 am and filed under felids. Bookmark the permalink. Follow any comments here with the RSS feed for this post. Both comments and trackbacks are currently closed. I refer, of course, to the ACCUSATION that Hitler, Stalin, and Pol Pot committed their crimes in the name of atheism. And yes, it would be good to have a Chairman Miaou. Don’t you mean that Hitler was a Catolic? Also, isn’t mao Mandarin for cat? I think it depends on the tone with which it is pronounced. So, sometimes, yes. 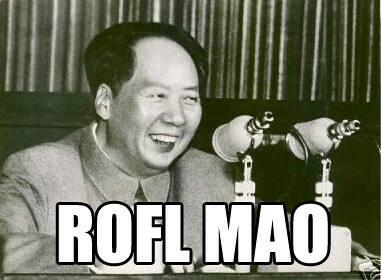 In Mao Zedong’s case , the mao means fur. Why would somebody take pictures of their cat and post them on the Internet because it looked like Hitler? I’d keep it a secret. I’m not saying anything about you just about those people. Maybe it looks like Lenin’s sister. With a goatee. That damn cat helped Stalin eliminate Trotsky! No, the cat didn’t because his brain had turned to mush long before. The cat never trusted Stalin and said so not long before the end. Read the history and you’ll find that Lenin and Trotsky paved the way for Stalin by concentating Soviet power in lesser and lesser hands as the Revolution unfolded. Stalin or someone like him was inevitable. Before I read the post and saw the Lenin picture, the first thing I though of upon viewing this cat was, “wow, that looks like Lenin.” Someone needs to shoop a hammen and sickle behind it. how typo much? Before I read the post and saw the Lenin picture, the first thing I thought of upon viewing this cat was, “wow, that looks like Lenin.” Someone needs to shoop a hammer and sickle behind her. Well you must admit, those eyebrow-simulacra are scary. Anybody else think the analogues of human facial hair bear a striking semblance to activated charcoal? At least, I hope it’s something like activated charcoal…if it’s some other form of cosmetics, I’d be worried about ingestion come bathtime…. You are so cynical, Ben. Trotsky had two alsations when he was in France in the 1930s. They were called Benno and Stella. Not many people know that. He also kept rabbits when in Mexico. For eating. And, frankly, the more disturbing resemblance is that of Lenin to Robert Van Winkel (aka Vanilla Ice). I feel a little ill now. And no, that’s not some sort of gag. Though I do quite feel like gagging. That actually happens to all cats that are fed store brand cat food. It makes them militant. It’s the eyebrows! The cat looks like Lenin when he was young & fit (& many thought handsome). Remarkable. She should be awarded lots of roles with that face.